Netanyahu's international spokesperson in a briefing to reporters: The PA is violating agreements. Israel reserves the right to respond. 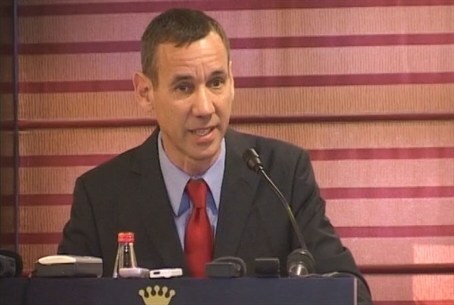 Prime Minister Binyamin Netanyahu’s international spokesperson, Mark Regev, gave a briefing to reporters in Jerusalem on Tuesday ahead of the Prime Minister’s visit to New York for the UN General Assembly. Regev pointed out that by going to the United Nations to ask for recognition of a state, the Palestinian Authority is violating agreements it has previously signed with Israel. Regev said Israel hopes the PA “picks up the ball” and returns to direct negotiations with Israel. Regev added that the UN General Assembly consists of more than 100 countries that will support anything the PA brings forward, no matter what. Regev reiterated that Netanyahu is willing to meet Abbas for talks anywhere, even in New York City. Netanyahu’s proposal, said Regev, is ongoing peace talks at the highest levels, until all the issues are resolved and results are reached.